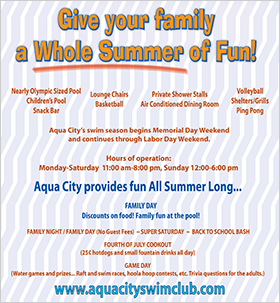 Aqua City Swim Club | Helping Make Your Summer Fun! Put a little "Aqua City" in your summer! Aqua City Spring Break Special! Save $111.00! As we prepare for the Summer Swim Season, we are pleased to announce that a Special Spring Break Discount is being offered again this year. In addition to a Family Membership Discount worth $50.00 for joining early, we are throwing in 2 FREE Guest Passes a $22.00 value, $25.00 in Concession Stand Credits, and an Aqua City T-shirt valued at $11.00!! 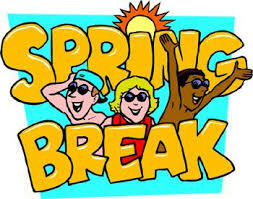 Save $111.00 by purchasing the Aqua City Spring Break Special Package. This offer is good through April 15, 2019. Just stop by the office to purchase one. Make this an AQUA CITY SUMMER! SUPER SATURDAY – June 1st – Invite ALL YOUR FRIENDS (No Guest Fees All Day)! June 6th is the last day for 50.00 discount if membership is paid in full. FAMILY APPRECIATION DAY – Saturday, June (TBA) – Grilled Burgers and hotdogs will be served free to members and their guests. Potluck style dinner. Bring your favorite side dish. Family fun at the pool! FOURTH OF JULY COOKOUT – Thursday, 4th – Freedom Dogs (free hotdogs) and 25 cent small fountain drinks all day! Fun for everyone! Come join us before you head out to see the fireworks! GAME DAY – Saturday, July (TBA) – Water games and prizes for all ages starting at noon. Raft and swim races, hoola hoop contests, etc. Trivia questions for the adults! Refer a Friend and Receive a Discount! Receive a discount of $25.00 toward concessions or membership fee just for referring a friend to join Aqua City Swim Club! Call for details. Check out our COUPON PAGE for GREAT SAVINGS at Aqua City! Check back often for GREAT DEALS!